The first step to gaining clarity on any situation is developing a clear, calm and collected mind. Without clarity and purpose our decisions are led by impulses. We may get lost at times. But someday we'll understand things clearly. The point is not to see clearly what is; the point is to see clearly what can be. Clarity is essential in our thoughts, deeds and service. Clarity always helps us to be focused on our visions in life. Clarity is the counterbalance of profound thoughts. 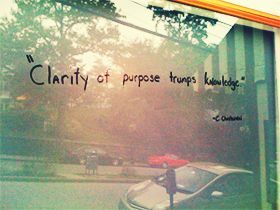 George Oppen says, “Clarity is the most beautiful thing in the world”. Another advantage of possessing clarity is that it allows us to reduce the number of misunderstandings when you make your position and thoughts clear. Clarity and transparency in your actions will certainly help to avoid a lot of confusion and achieve things better. Clarity also offers more accessibility for both the parties involved as there is no mystery that surrounds and no inhibitions. When there is clarity in business, it will be beneficial for both the sides involved. Clarity in relationship will be hassle free and peaceful. Hence clarity is essential in all walks of life. Here read quotes on clarity and be better know ledged.